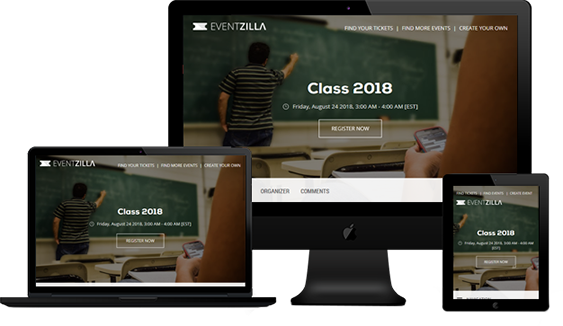 Enroll students online, save time and money with eventzilla. One size does not fit all and we understand that. That's why we've built in an easy way to customize your classes' registration forms. Communicate with your attendees with notifications, send surveys after the class to understand their feedback. A mobile-friendly registration website for selling tickets for your Class. Credit cards are processed securely and payments are sent to your account immediately. Offer incentives for your attendees to promote your event on Facebook & Twitter. Offer optional add-on tickets for workshops and merchandise on checkout. Improve conversation rates with early bird offers and discount codes for your students. It takes less than 5 minutes a professional looking event registration website. When a class fills up, we automatically close registration and allow students to sign up for the wating list instead. Eventzilla will easily create payment plans for a given student and automatically charge their card. You just receive the deposits and the increased enrollments! We have built-in Excel reports throughout the system so you can get right to the data you need.